Hot Cross Buns after the Good Friday morning service. Coffee mornings with a second-hand book stall , card stall and raffle are held normally on the first Saturday of every month (10.00 am to 11.30 am) in the Parish Room next to the church. Come along and bring friends to this welcoming event. The last Sunday of the month we hold a poverty lunch after the 10.30 am church service to share a meal, remember those with little to eat and to raise funds for charity. These lunches consist of simple fare of soup, bread and fruit. All are welcome to join. The STIFF walks are designed to be enjoyed by all ages, from the elderly to the young (accompanied children always welcome). So long as you are healthy, able to walk, with a good pair of trainers, stout shoes or even better, walking boots, and not afraid of a little mud(! 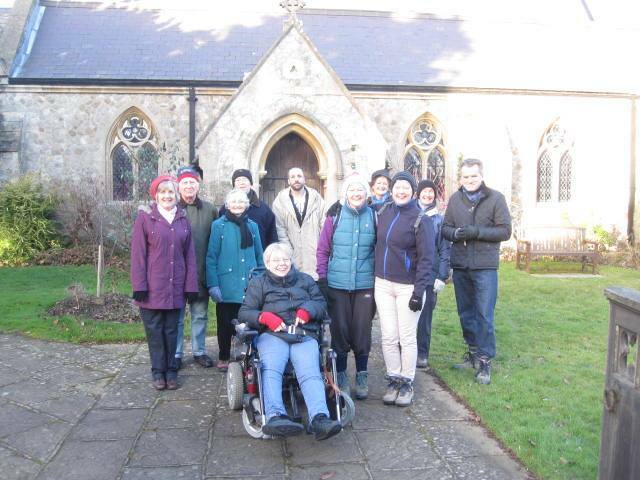 ), you are welcome to join any of the walks, whether you attend St Thomas Church or not. The general pattern is for walks to take place approximately once a month on Saturday mornings leading to a pub lunch, so money is needed to pay for lunch. The longer walks resume afterwards. Typically walks are between 3 and 6 miles. The sewing and knitting group usually meet the first Tuesday of every month at 2.00pm. The sewers and knitters create patchworks or garments to raise funds for various good causes or to create items for church. If you are interested in joining, further details are available from Angela Dewar.